Please enter the email address. Separate multiple addresses with a comma. Make sure you pack enough of your anti-HIV drugs to cover your trip. Some live vaccinations are not appropriate for people with HIV. Some countries refuse work or residency visas to people living with HIV. Many people living with HIV travel regularly for work, business, study, and for pleasure. In most cases, HIV is not a barrier to travel and holidays. This factsheet provides an introduction to some of the issues you may want to think about if you are planning to travel. As for other long-term health conditions, it is sensible to consider your health and medication when you make your travel plans. At the most basic level, consider if you are well enough to undertake the trip you are planning. People living with HIV are able to travel to most countries of the world. But some countries have restrictions on entry for people with HIV, most often for people applying for a work or resident’s visa. See Travel restrictions below. Also, find out if you need any vaccinations or other preventive medicines, and if it is safe for you to have them. What vaccinations you might need depends on where you are travelling to. If you are accessing travel vaccinations through your GP, it is important that they know you have HIV so they can give you the most appropriate care. It’s also important your GP knows about all the drugs (including anti-HIV drugs) you are taking, in case there are any possible interactions with drugs you might be given for travelling, such as anti-malarials or antibiotics. People with HIV are recommended to avoid some live vaccinations. It might be very difficult, or even impossible, to get supplies of your medication once you’ve left home – even if you are just taking a short trip in the UK or Europe. Therefore, make sure you take enough of all your medicines with you to last the full duration of your trip. It might be wise to count out your medicines before you travel and to take a few additional doses just in case you are delayed. "If you are travelling across time zones, this will have implications for the time you take your medication. Generally, it’s best to adapt to the time zone of your destination as quickly as possible." 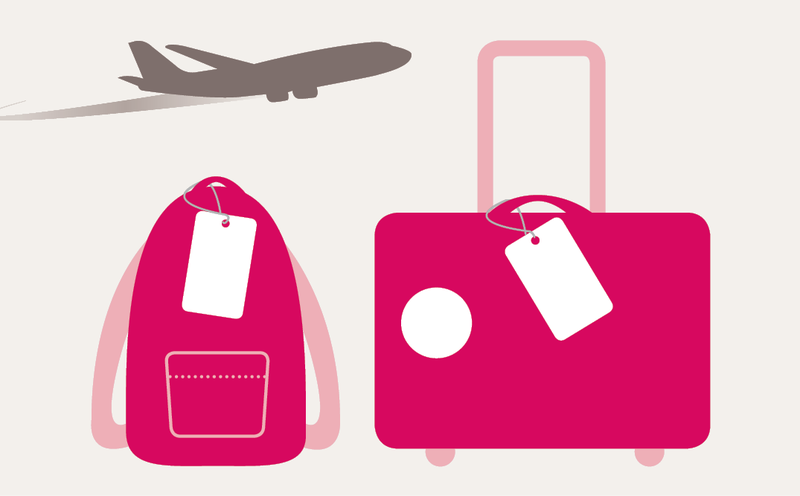 It’s safest to carry your medication in your hand luggage, as this is less likely to get lost. Or you may choose to put some in your hand luggage and some in your suitcase, in case either bag is lost. If you are travelling to another country it makes good sense to have a copy of your prescription or a letter from your doctor explaining that your medicines are for a chronic medical condition. Treatment breaks are not recommended. If you are thinking of taking a break from your HIV treatment to travel, then you should discuss the possible risks of this with your doctor. These risks include developing resistance to your drugs, being more vulnerable to health problems in the future and – if you have a low CD4 cell count – of becoming ill while you are not taking treatment. If you are travelling across time zones, this will have implications for the time you take your medication. Generally, it’s best to adapt to the time zone of your destination as quickly as possible – if you usually take medication with breakfast at home, you should take it with breakfast during your trip. Keeping the same routines around pill taking will probably help your adherence. If you are stable on treatment with an undetectable viral load, then taking one dose of your drugs a few hours early or late, because of a change in time zones, will not usually cause problems. You can get more detailed advice in our factsheet on travelling with HIV medications and time zone changes. You can also ask for help from your doctor or pharmacist. If your trip is in the UK you should contact the nearest accident and emergency department if you need emergency care. You can be seen by a GP away from home as a ‘temporary resident’ if your trip is for under two weeks. If you are entitled to free NHS care, you can get this anywhere in the UK. If you are travelling to Europe, you should obtain a European Health Insurance Card (EHIC) before you travel. Take this with you, as it allows you to obtain reduced-cost or free medical care in all countries in the European Economic Area (EEA). You can apply for an EHIC online here: www.nhs.uk/ehic. You can also apply by telephone on 0300 330 1350. Be careful when applying for the card online. It should be free, but there are some companies which charge you to apply for the card. The UK also has agreements with a handful of other countries allowing for free or reduced cost emergency medical care that a person may need. This includes Australia and New Zealand but details should be checked before you travel. It may also be wise to consider taking out travel insurance. Most policies specifically exclude treatment for a pre-existing medical condition (this would include HIV), but will still provide cover if you have an accident or become ill with something unrelated to HIV. Some companies provide travel insurance cover that includes HIV. Premiums are calculated on an individual basis. You can travel to most countries of the world, especially for short visits, but some countries have put in place restrictions on people with HIV entering their country, staying, or becoming a resident. As well as many countries in the Middle East, this includes Australia, New Zealand and Russia. UNAIDS, the Joint United Nations Programme on HIV/AIDS, has made eliminating HIV-related travel restrictions one of its key targets. Its executive director, Michel Sidibé, has gone on record saying, "Placing travel restrictions on people living with HIV has no public health justification and violates human rights". According to UNAIDS, as of September 2015, there are 142 countries with no HIV-specific restrictions, but there are still 35 countries or territories which have some restrictions. Five have a complete bar on the entry and stay of people living with HIV: Brunei Darussalam, Oman, Sudan, United Arab Emirates and Yemen. You can check for updates on the UNAIDS website (www.unaids.org) or check with the embassy or consulate of the country you want to visit. The USA’s long-standing ban on people with HIV visiting or migrating to the country ended in January 2010.